My so-called ‘kate-flour‘ has miraculously transformed my entire experience of baking from The Cake Bible this last week. Witness my Golden Luxury Butter Cake, formerly known as a soggy, dense lump of play-dough. However, it appeared that Dove’s Farm speciality pasta flour was key to this success … and also that some people were having difficulty sourcing this in their local supermarkets. Rose asked me if the microwaving/cornflour method might work for plain flour too. If so, this would make it virtually universally possible to create ‘kate-flour’ in place of ‘cake-flour’. Thinking things through once again in the early hours of this morning (my 6 month old doesn’t yet ‘sleep through’), I remembered that the whole point of microwaving was to reduce the moisture content of the flour being treated to about 1% to 5%. This apparently makes the starch less impervious to water and allows it to gelatinize and swell. What if I had simply failed to reduce the moisture content of the plain flour sufficiently? If my plain flour had a higher starting moisture content than my pasta flour, wouldn’t it then require a longer treatment time in the microwave to reduce the moisture content to within the desired levels? First thing this morning, I rushed out to buy some more McDougall’s plain flour. I weighed out 10 oz, spread this on a pyrex plate and blasted it on high in the microwave for 3 bouts of 2 minutes each, stirring the flour in between. I then substituted 2 tablespoons per cup of microwaved flour with 2 tablespoons of cornflour, and used this mix to bake yet another Sour Cream Yellow Butter Cake. The soggy, dense lump I made yesterday with plain flour that had been microwaved for a total of only 3 minutes is on the right. The soft, melting creation I baked this morning with plain flour that had been microwaved for a total of 6 minutes is above, on the left. Hello again, Kate, very interested as usual to see what you have been up to! In your opinion do you think the latest cake you’ve made is is good as the one made with the pasta flour or is it better? I made the almond cake this morning to see if it turned out as well as the chocolate one I made last week(which incidentally was very good !) . I t wasn’t until I’d put it in the oven I realized I hadn’t done the cornflour exchange! I nearly cried, as I’d taken so much care with it. However it looked alright , not risen as much as I’d liked, but it will be eatable, so all is not lost. I have marked the flour bag DON”T FORGET THE CORNFLOUR! I do admire your persistence with the flour experiments you are doing, who eats all these cakes? 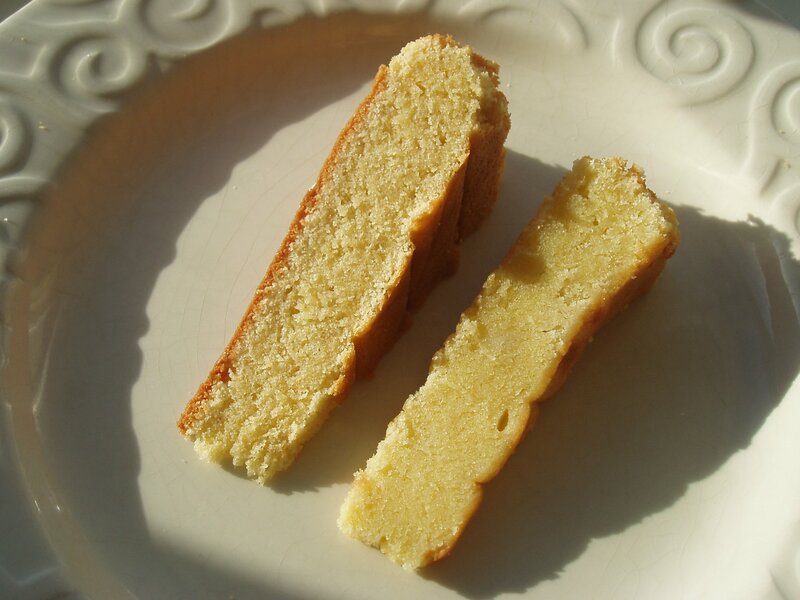 I have the fondest memories of the yellow butter cake I made with the pasta flour/cornflour, but that was several days ago now … I’d really need to taste them side-by-side to see how they compare. Who eats the cakes? Well, my husband has a group of very willing guinea pigs at work. I also have 3 children (okay, the youngest isn’t eating cake yet, but he’s looking very interested in it 😉 ) . And we’ve had builders working on our house for the last 7 months … (hmm, perhaps there’s a connection …?!). How was your almond cake without the cornflour? Very interesting Kate! The cake looks the ticket! When I get my Shipton Flour I will call on you for instructions for exactly how long to nuke it, etc. Builders for 7 months! Don’t let them get too comfortable or they may never leave. Feed them the bad cake. I have followed this blog with interest and even tried it with cake flour with improved texture results. I microwaved 250gms of Anchor cake flour (Australia) in a pyrex dish at 2cm depth for 2 X 3mins on high (800W) with stirring in between. This resulted in a loss of 10% in the weight of flour due not only to loss of moisture but also to loss of some flour as it had to be sifted afterwards to remove some minute lumps which looked like cooked flour. All this volume of empirical evidence now needs is to be correlated into a clear formula for bakers to follow viz type of flour, quantity, depth of spread, microwave time per gram or ounce, microwave power. Well done. Correction to previous post, microwave time was 2 X 1.5mins (total 3 mins). geejay, it’s very interesting that you noticed improvements even when using cake flour (was it bleached? – I haven’t come across Anchor flour in the UK). I’ve just been so fascinated with your discovery and I really appreciate your time with all the countless experiments and detailed reports! This is my first time trying out Australia’s Anchor flour (plain flour version for cake, biscuit and pastry). It’s unbleached at 8.5 gm protein per 100gm. I don’t think they have cake flour. The other versions they have are the self-raising sponge cake flour, the TIPO OO flour for pasta & noodle plus another flour for scones. I tried microwaving 250gm of the plain flour for the same duration as Geejay. Then for every cup, I substituted 1 tbsp cornflour instead of 2 tbsp as I thought the protein content of this plain flour was already pretty low at 8.5gm. This is my first time baking Rose’s recipes and also at trying this brand of flour and treating it with the ‘kate-flour’ method so I can’t make a comparison with previous attempts. But I tried baking Rose’s All occasion downy yellow butter cake. The cake rose beautifully in the oven, almost to the top of the pan (made 2/3 the recipe as pan was 9-inch by 2 inch) and it took 35 mins to bake. Now i wonder if my oven temperature was a bit low as the cake bible states the full recipe should take about 25 to 35 mins. Well 5 mins after the cake was out of the oven, it sank (and my heart dipped as well!) to about 1 inch in height. The top of the cake looked really ‘wrinkly’ instead of the smoothness it had whilst in the oven. Parts of the cake, closer to the middle, especially the top portion was pretty gummy whilst the texture at the edges was better; finer & more tender but the whole cake was still rather dense & compact. Perhaps my oven temperature might be the possible cause or maybe I should have substituted 2 tbsps cornflour even though the starting protein content was already at 8.5gm? Geejay, did you do the cornflour substitution after microwaving your flour? I had similar results when I microwaved plain flour for only 3 mins total. It was only when I microwaved it for 6 mins total that the true texture emerged. Also, I think bleached cake flour can be as low as 6% protein, so I think I’d probably still substitute 2 tbsps per cup of your 8.5% flour with cornflour. I’ve always made this substitution after microwaving the flour (effectively turning the plain flour into ‘bleached’ flour first and then following the US rule-of-thumb for creating cake flour). I don’t know about your oven temperature, but does that help any? I assume it is Australia’s version of American cake flour since it specifically calls it “cake” on the label, as opposed to just “plain flour unbleached” which is what other brands offer. This is a fairly recent product appearing in the supermarkets here. Kate, an addendum. I have been using this Anchor flour as “cake flour” without any cornflour substitution, prior to your blog and the results have always been successful. Prior to this I used cornflour substitution with plain unbleached flour. This of course gave better results than just plain flour unbleached. Bleached flour is not available in Australia. I did not do the cornflour substitution with the Anchor flour as I assumed it was close to American cake flour. My aim was to add “bleached” to the description. I would use the cornflour substitution only with plain flour because the aim is to create low protein, bleached flour. I have used this successfully prior to the Anchor flour coming on the market but I have yet to try microwaving the plain flour first. That’s on the to do list. I made the All Occasion Downy Yellow Cake a few weeks ago with nonmicrowaved Anchor Cake…….Flour, following Rose’s instructions to the T and there were no problems. Thanks for clarifying, geejay. Yes, that makes sense. Would you be interested in helping to compile information about how different flours respond after heat-treatment via microwaving? I have no knowledge of Australian flours, so your expertise would be invaluable. Thanks Kate and Geejay for your feedback! Let me first check the accuracy of my oven temperature. Then I will try baking the All Occasion Downy Yellow Cake once more. This time with microwaved Anchor flour and the cornflour substitution (just curious to know whether if the cakes’s texture could be improved further with it). I am an American living in Bangalore, India. I have been so frustrated with the flour we get here compared to flours available in the US and Europe (my last home was in Germany). I will gladly take part in the cake test. I am going to make a chocolate cake today (American Chocolate from CB). I hesitate to put in the cornflour because it seems to give the cake a metallic taste, but I haven’t nuked the flour before either. PS Anybody who’s worrying about her oven temp is on the right track. When your product turns out gummy or horrible or sunken, it is usually because the OVEN is not circulating the air or isn’t heating enough or too much. Get a thermometer and use it each time. If you oven is a awful as mine, there isn’t a lot you can do except move the cake a lot. I cannot believe my eyes when I read that you now recommend bleached rather than unbleached when baking. What’s going on ???????? Good luck with your next cake, Sharon (I know what it’s like when children are ‘helping’ in the kitchen!). Hi Terrell – thanks for raising this point. We’re not recommending bleaching – rather, we’re searching for a way to obtain the advantages that bleaching offers without actually bleaching the flour (ie. heat-treatment as an alternative to bleaching). Does that make sense now? My American Chocolate cake turned out just great. Better than any of my India cakes to date. I followed the nuke 2 minutes 3 times method. What a mess, but worth it for the results. I was using a pie plate for the flour. Next time, I will use a deeper dish. I did add the cornflour after all, and did not get the metallic taste. This idea is a sure winner. Thanks so much for all your research. That’s wonderful, Mona 🙂 – thanks for letting us know how it turned out. It’s especially encouraging that you found microwaving to be successful since I guess you are able to compare your cake with those you made in the US with bleached flour. My Flour from Shipton Mill has arrived. I have also the French flour, Francine, to try out too. I microwaved the flour 2 mins x 3 times and the flour came out pale brown. Is this supposed to be the case ? Which flour are you using and what power is your microwave? You might find my next post, https://amerrierworld.wordpress.com/2007/11/10/getting-warm/ more helpful … In general, the 00 grade flour I’ve microwaved at 750W for up to 5 mins total has not changed colour. Heating plain flour up to 130 degrees C resulted in very slight goldening, but nothing extreme. I used cake flour but was unsure whether it was bleached or unbleached. As my cupcakes were a dense lump, I decided to try microwaving the cake flour. I did a second batch of microwaving for only 2 minutes at 1000w (min. setting for my microwave) and the flour came out fine. However, after my cupcakes were baked, they fell out of the cups even though I had not sprayed non-stick. They shrunk a fair amount as well. I did not have this problem when I did not microwaved the flour. Why do we add cornflour to the microwaved flour ? Do I have to add cornflour to the microwaved cake flour ? Do I always substitute 1/2 oz cornflour ? Hi Celine – sorry to hear about your cupcake problems. There are too many unknowns for me to be able to suggest anything – only, did you use one of Rose’s recipes from The Cake Bible? It would be helpful to know whether your flour is bleached or not, as microwaving is only intended here to be a substitute for bleaching (ie. it’s not a catch-all for solving soggy cake recipes 😉 ). The cornflour is added to lower the overall protein content of the flour if it is significantly higher than that of cake flour (I’ve suggested adding cornflour for flours that have a 9% or more protein content). 2 tablespoons of cornflour weigh about 1/2 oz, so yes, I always add the cornflour by weight rather than by measuring. Hi Kate, thank you. I was using Rose’s Chocolate Cake recipes in the Cake Bible. Pertaining to protein content in the flour, it is exasperating that this is not reflected on the packaging. In fact, it is not reflected in any local flour packaging in Singapore. I will have another go with the flour later this evening and see what happens. Celine, I’ll email you the testing guidelines so you can follow them through to see if your flour will convert successfully or not 🙂 . I found your blog after reading some posts from realbakingwithrose. I live in Slovakia (Eastern Europe) and I am very interested in the way you are having success in treating your flour. Over the past 7 years of baking here (with American recipes) I have found many differences in ingredients: butter, flours, baking powder, buttermilk, creams, etc. I have found some success in making changes with these, however I continue to have big failures with one particular cake: German Chocolate Cake. I’m curious if treating my flour (as you describe) will finally solve this problem. So I will try it. I have one question though about the “cornflour”. I have tried previously to find it here when I wanted to make corn tortillas. However, the translation for what I would call corn starch, translates “corn four”. So I just wanted to ask for a clarification about this. Thank you for any advice you can offer! Hi Kim – whether or not the kate flour will make a difference to your German Chocolate Cake really depends on the recipe (it’s not one of Rose’s, is it??) … good luck. I’m afraid I can’t really help out with the cornflour translation. The BBC Food Glossary has a helpful explanation of the ingredient at http://www.bbc.co.uk/food/glossary/c.shtml?cornflour – it’s different from the stuff you would need to make corn tortillas (Masa Harina). Hope that helps 🙂 . For the Aussie bakers who are looking for CAKE FLOUR, you can get them at Asian groceries and it’s a brand made in Taiwan which has big writing “CAKE FLOUR” at the front. It’s sold at 500g for around $1.75, and the protein content is as low as 6.67g per 100g of flour. The lowest protein content in the flour that is available at supermarkets (e.g. Anchor) is 8g per 100g of flour. Thus, I’m not surprised even Anchor cake flour requires ‘bleaching/heating” in the microwave for the effect we are afer. 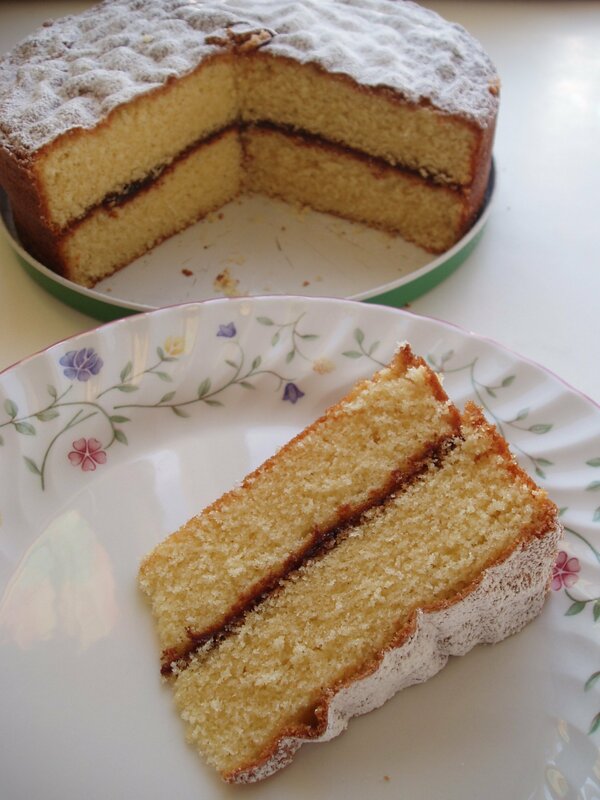 I tried making a sponge cake today with my new discovery and the result was amazing – soft and fluffy (even without adding baking powder). I used the French recipe for genoise sponge. I got here because I was reading a thread in Rose’s blog and I must say that the kate flour seems a really great alternative. I’m new to baking and I haven’t tried using cake flour yet since its quite expensive in my country so I’ve been using plain flour that I find in the local supermarkets. I’ll definitely give this a try though I’m not so sure if I can get cornflour here since I’ve been looking for them and haven’t seen any local store sell it. Wow Cecilia Lau – That is the best thing I’ve heard in my search for an equivalent flour in Aus for Rose’s recipes! There are loads of Asian groceries in Marrickville near me, fingers crossed I can find this Taiwanese “cake flour” I will buy the whole shop out if I can find it!! as yes, the lowest I have found is 8gm and the best alternative I had found previous to that is the Italian Tipo 00 10gm flour which I had previously used to make Pasta and cookies, is very soft and fine and works beautifully somehow for my chocolate cupcake recipe – Which has a surprisingly low amount of butter and eggs compared to Rose’s recipes. However worked horribly with anything with sour cream involved, turned out heavy and gluggy and solid. Is what you are calling corn flour, what we call cornstarch? I was taught scale 12 ounces of flour add 4 ounces of corn starch sift it in very well, several times , use as directed.